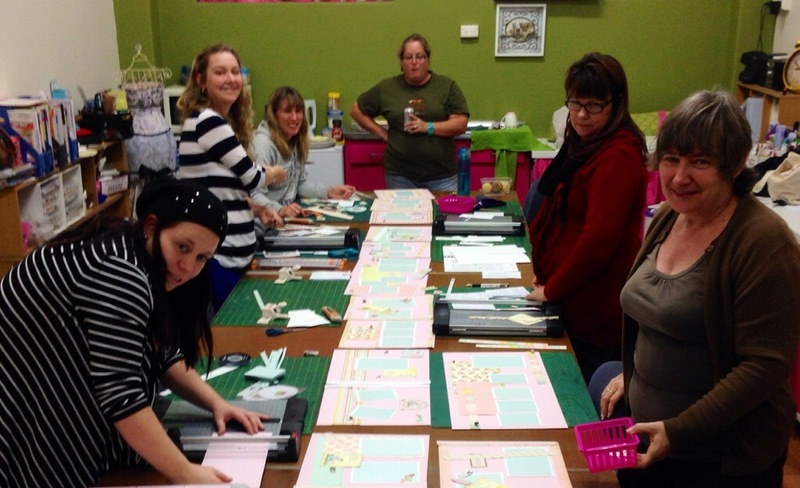 As well as having a great time dressing up we do actually spend most of our time scrapbooking and paper crafting at our Scrapbook Retreats. 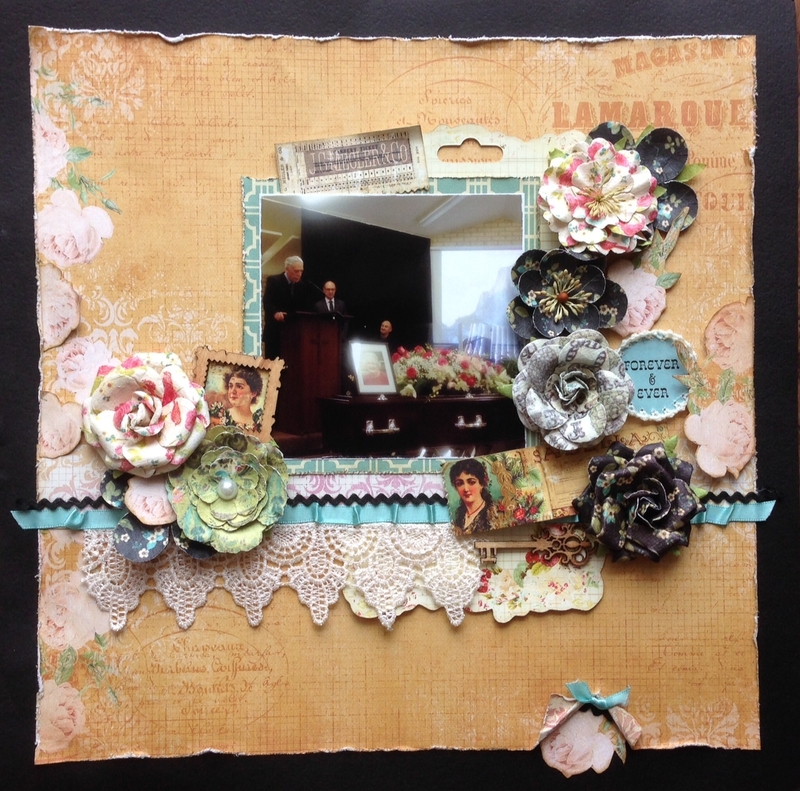 So, I thought I’d share some of the pages that were completed over the retreat weekend. 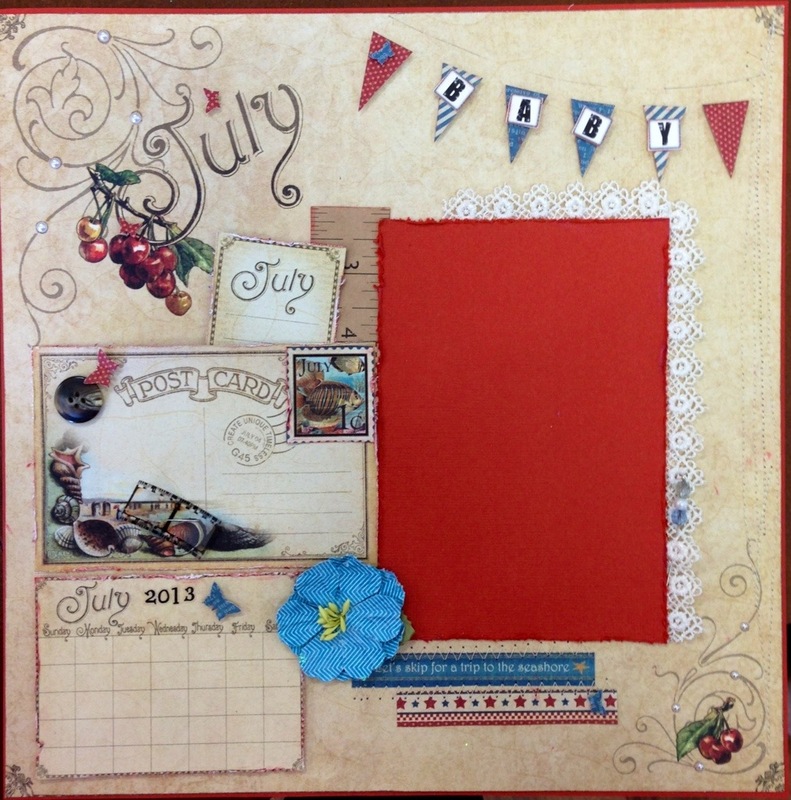 Here are some of the “Challenge Pack” layouts from over the weekend. I can’t remember who won and I was sure there were more… but they all did a terrific job don’t you think? 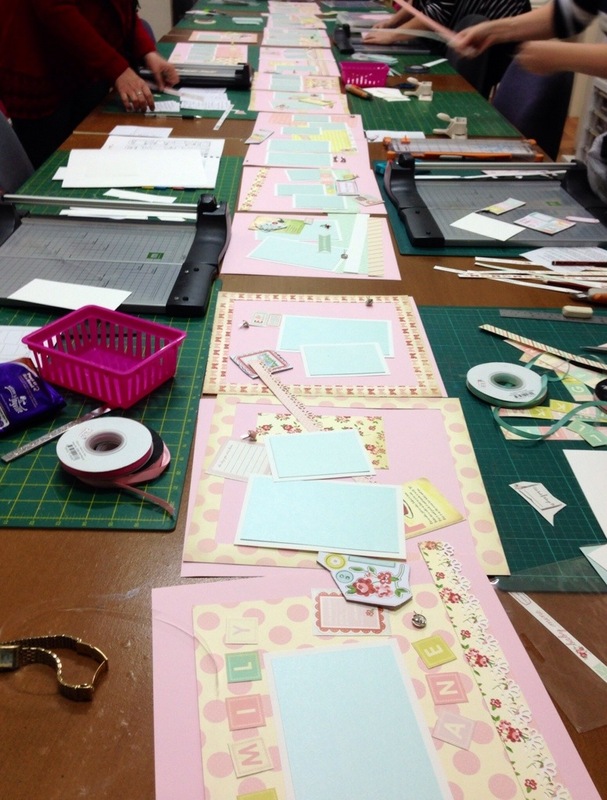 Janine decided to use her scrapbooking skills and make a “baby’s first year” calendar. 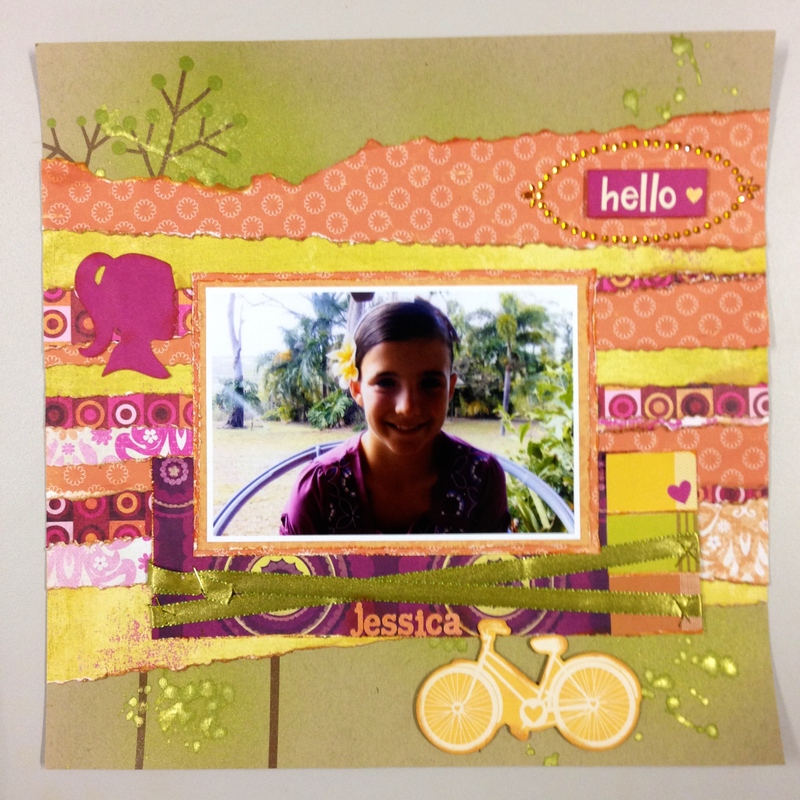 Using Graphic 45 papers no less! 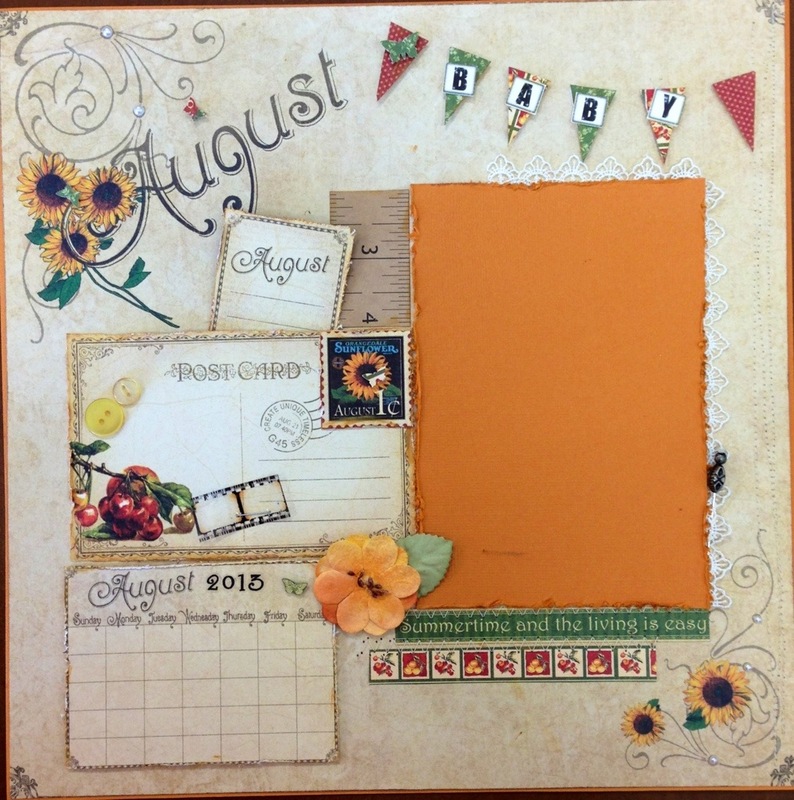 Janine created 12 pages, one for each month following a layout design that allowed for a photo to be added, and a little journaling, or the circling of a date on the calendar. 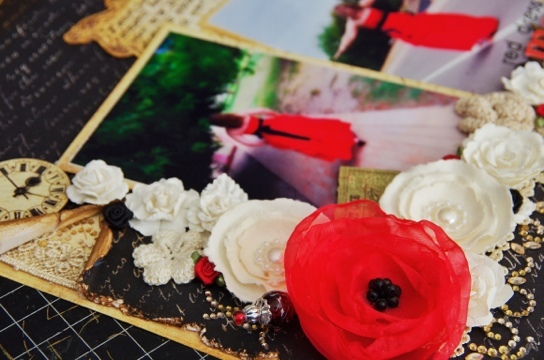 So much gorgeous work, I know how she toiled to have this just perfect. 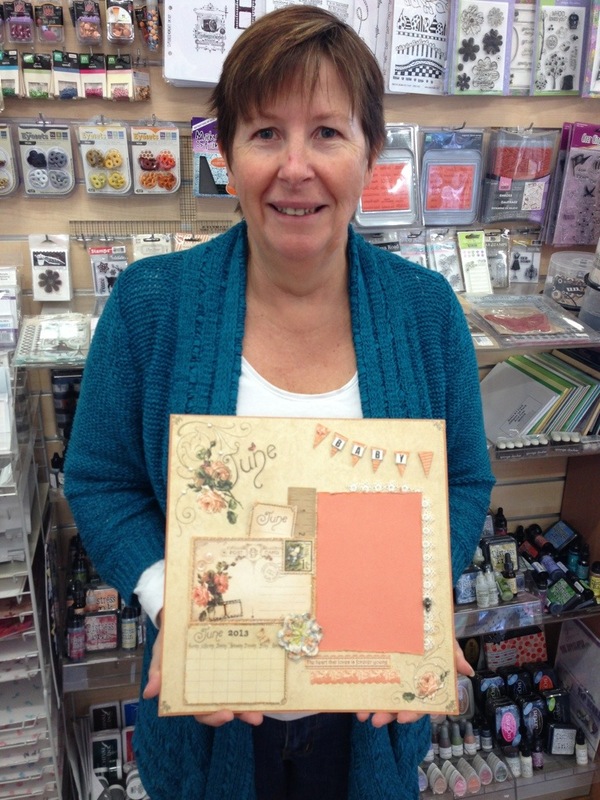 She also made a front cover and last page to add to it, and adhered each page to the Graphic 45 Stand up Album – perfect for a calendar with its 12 pages. 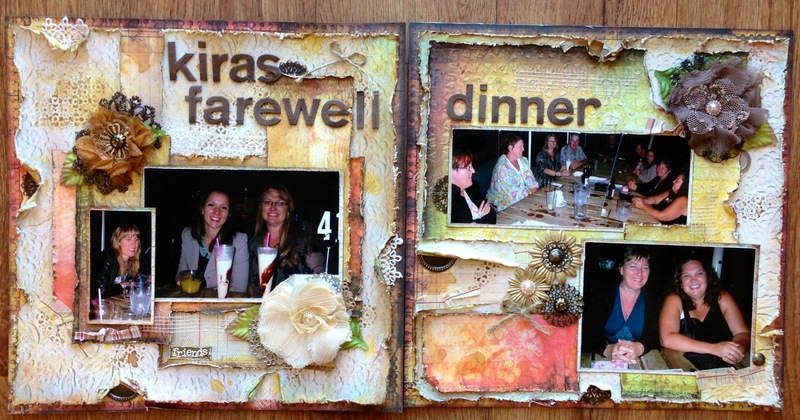 And its so very thoughtful, one the year is done, each page can be removed and placed in an album to keep. I bet Kate will love it. Wishing you good things, wherever you are. 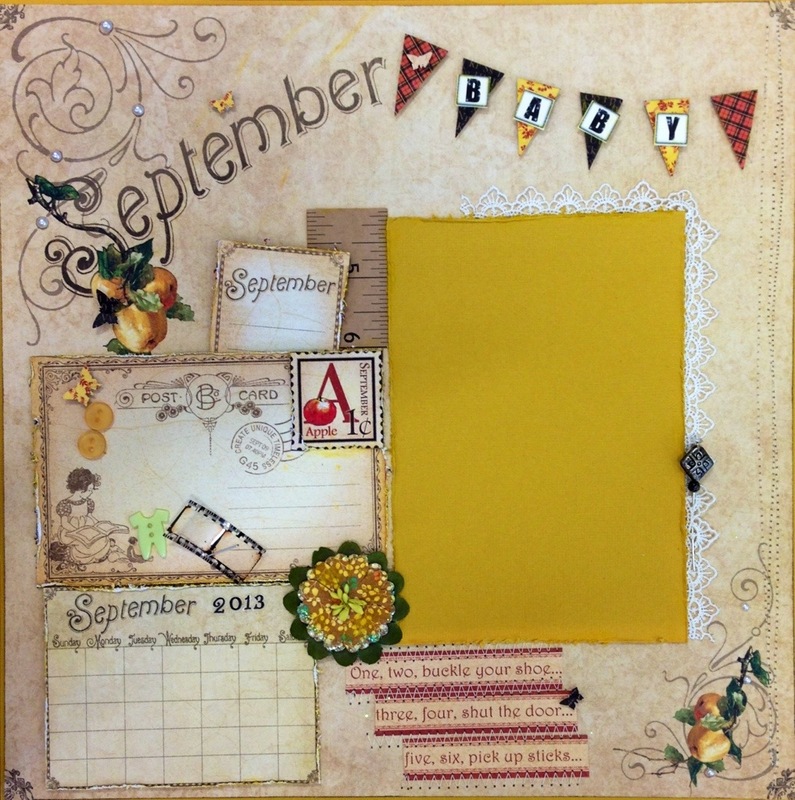 Here is my version of last week’s class kit, a Finnabair style inspired layout by Basilia. 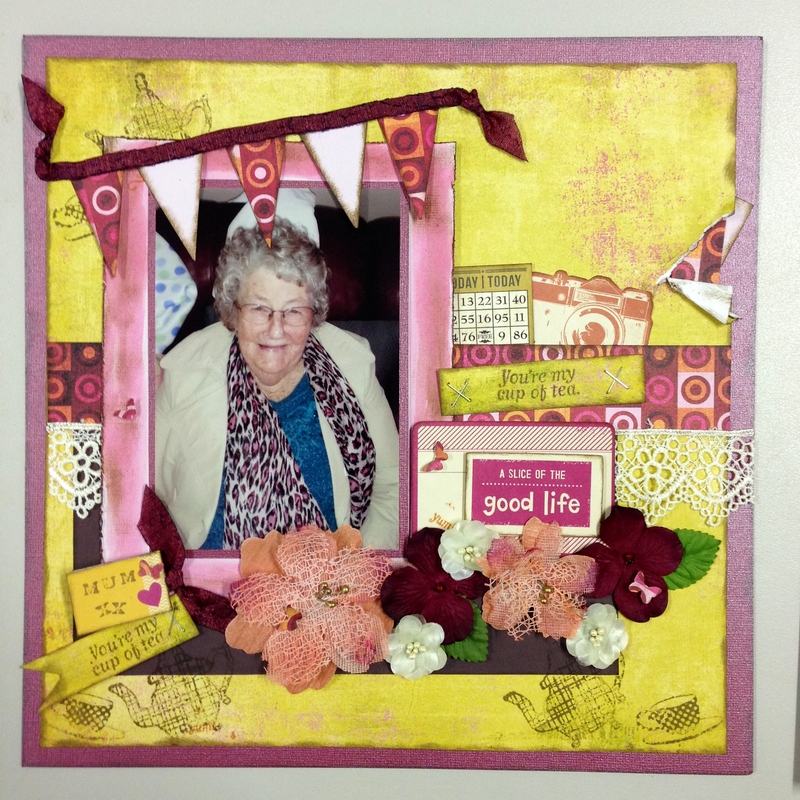 It was great to be able to create a double page with the leftovers as there were few photos to fit on – thanks to Viv for the photos! I loved all the little rips and tears and tucking little surprises inside. 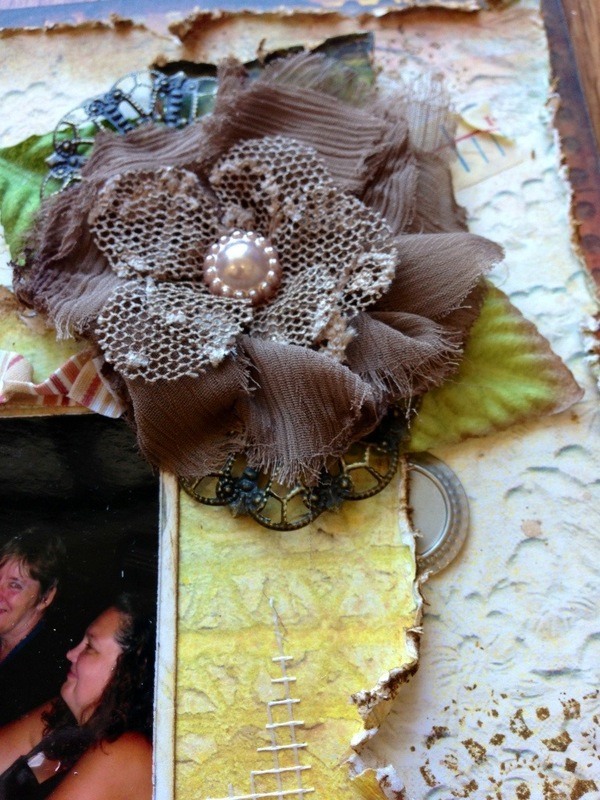 We cut up the metal trinkets and flowers, very easy to do with a pair of scissors which surprised me. 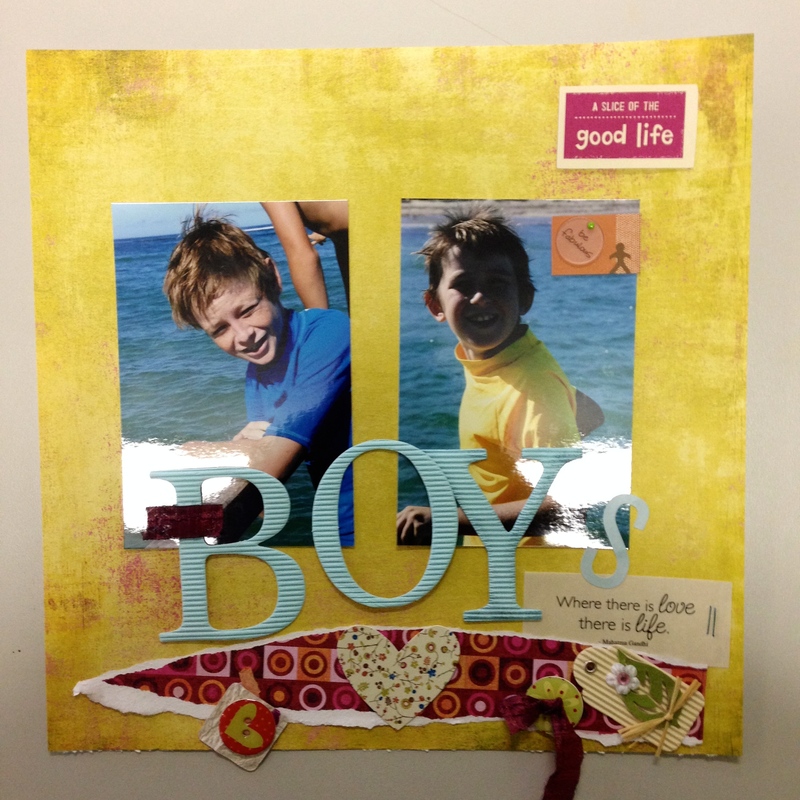 The ladies who did this page in class all enjoyed it and ended up being very happy with the result. 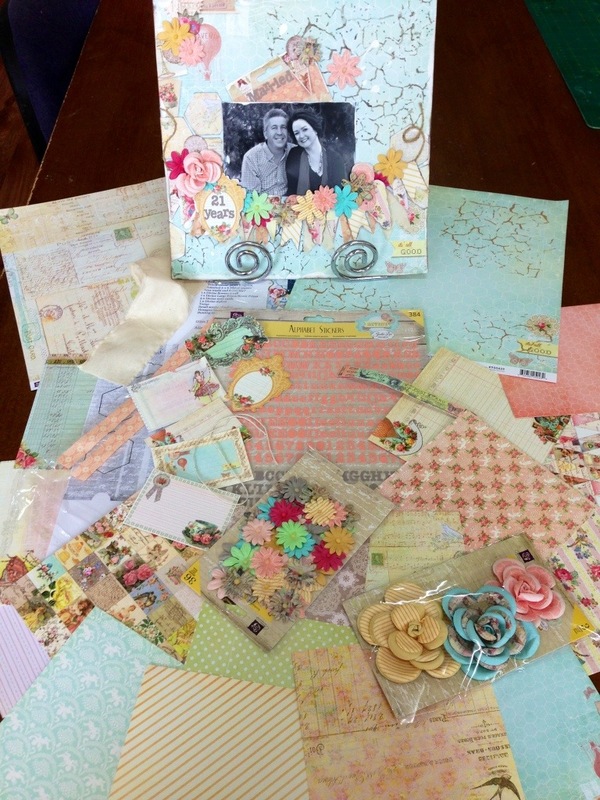 We have these kits for sale, includes all products and instructions, email me if you’d like me to hold you one! 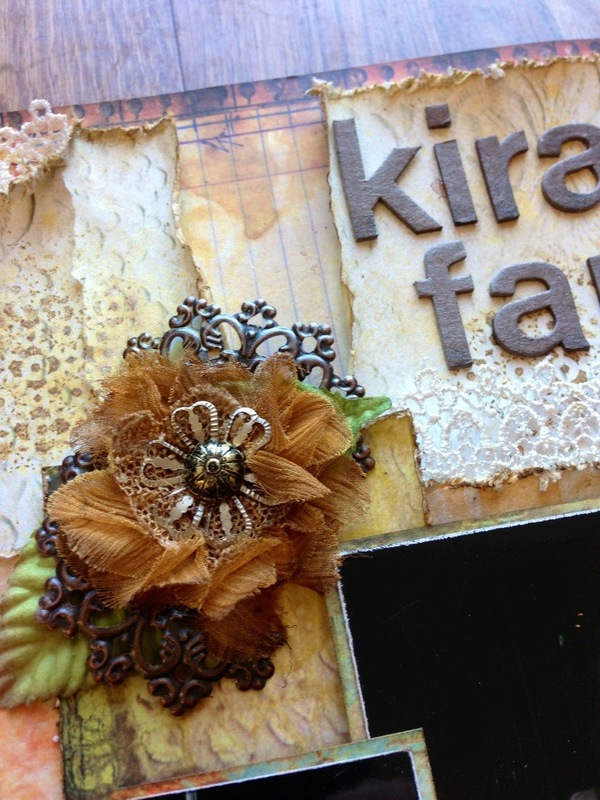 This range by Finnabair was created with Prima, so of course along with the metal mechanicals there are flowers! 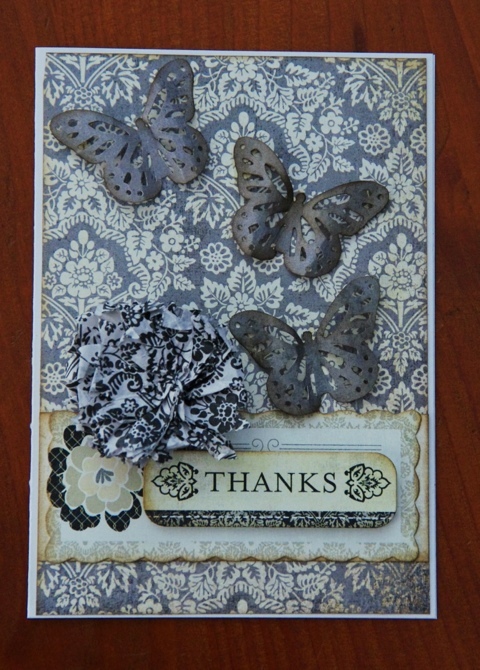 Thanks for looking – have a great day! 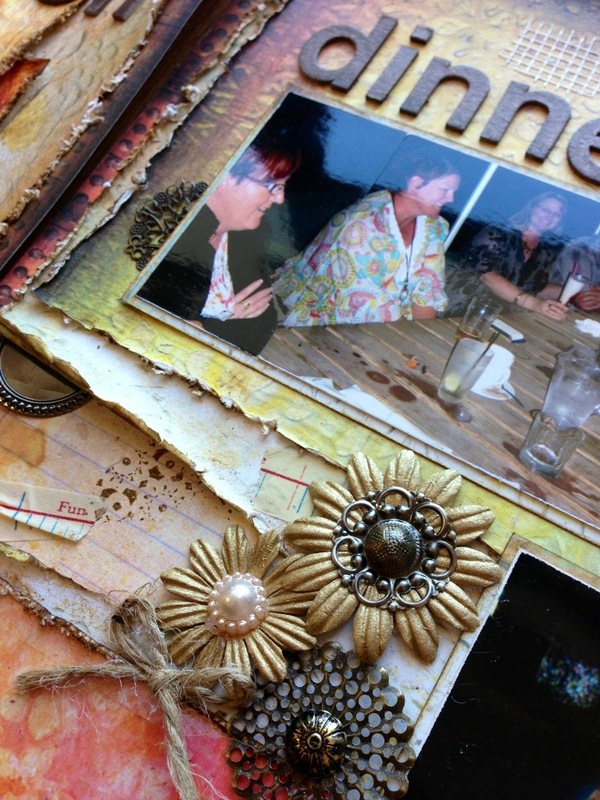 May’s layout for Page of the Month features four photos, tons of room for a title and journaling, and is ruler-straight with special area for shapes, texture and dimension for a page that really POPS. What’s Up works great with both colour and black and white photos and features the fuzzy felt shape stickers and brand-new flags. 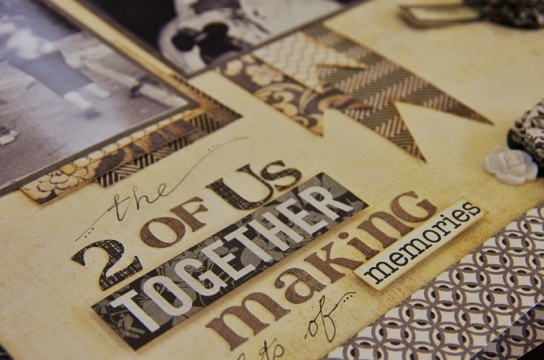 May’s theme is “What my Parents Taught Me”and is a chance to scrapbook cherished advice from a loved one. 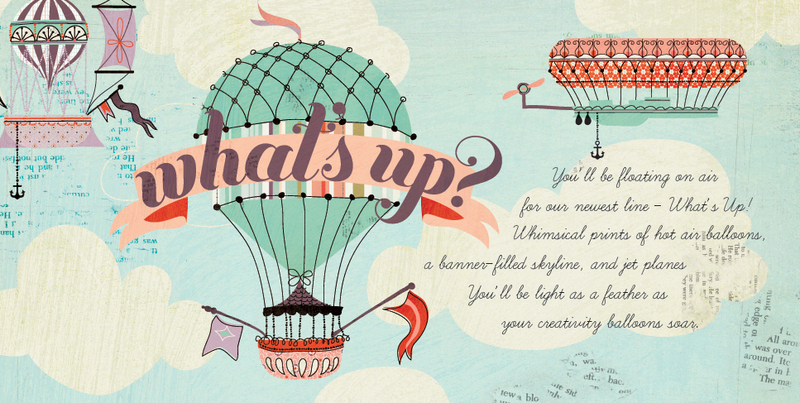 The Parisian-inspired colours and designs of What’s Up work perfectly for all types of topics for advice. 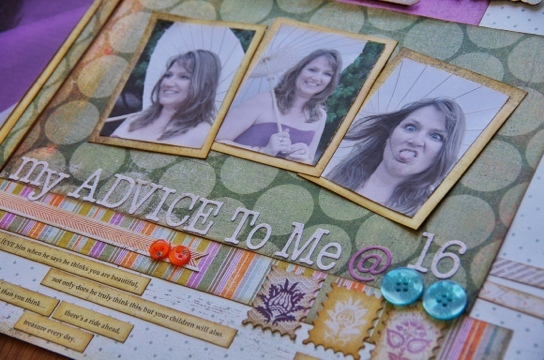 Photos can feature scans of family photos or evidence of advice followed. 1. 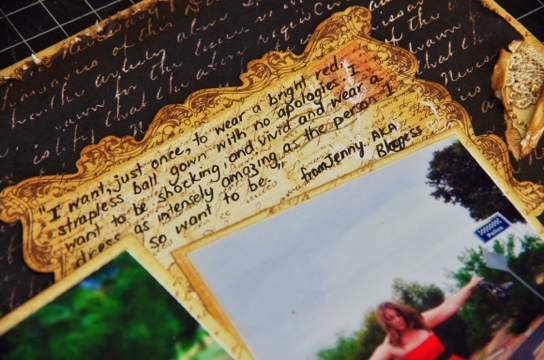 What is one of your favourite pieces of advice about? Food? MOney? Work ethic? Cleaning tips? Driving? Fashion or style? 2. Did your parent(s) teach you by telling you or by showing you what they meant? 3. How has this advice impacted your life? 4. Is this a lesson you will pass down? 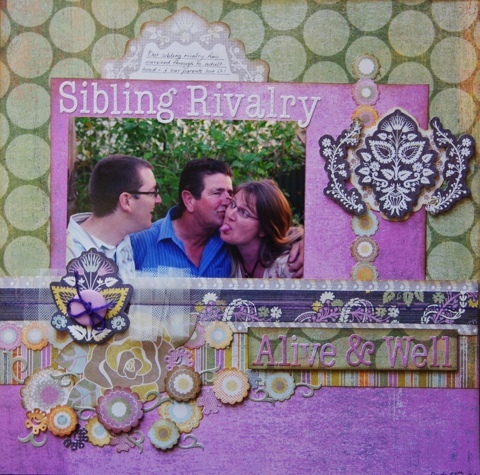 I think we will enjoy tonight’s Page Of The Month scrapbooking. Feel free to comment with your own answers to these prompts! We’d love to hear it! You know, I get to meet some of the most amazing woman in our community, they come and go though the store, sometimes giving us a glimpse of how marvelous they are, other times we know that they don’t even know themselves how amazing they really are. I just love meeting the people I do. Some are artistic, some are compassionate, some funny, some creative, some a great with colour, some are learning, some need a shoulder, and a couple I know need new shoulders! I meet great Mums, and excited Grannies, I meet people who love their families. 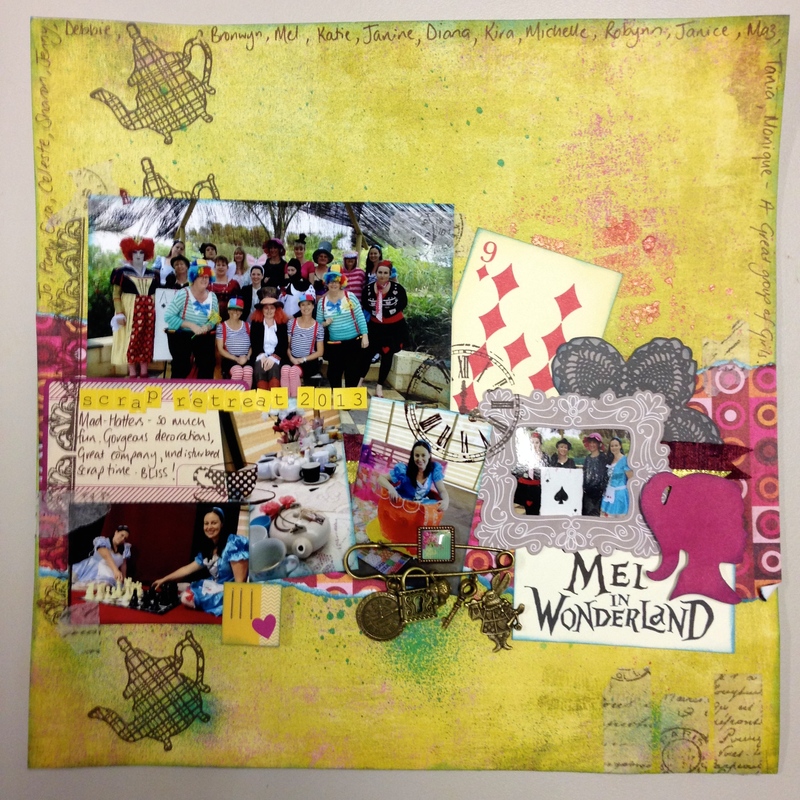 I meet other like-minded scrapbook store owners and I meet people online. I have made friends with people all around the world, from Australia, New Zealand, America, Canada to the Netherlands. I love my job, and the people who surround me… Thank you. You make such a difference in my life. 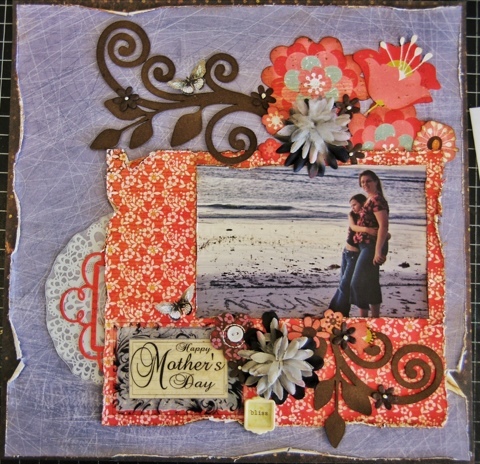 Here is a layout from one of the amazing women who has come into my life through The Scrapbook House, her name is Julie and I think she is terrific! 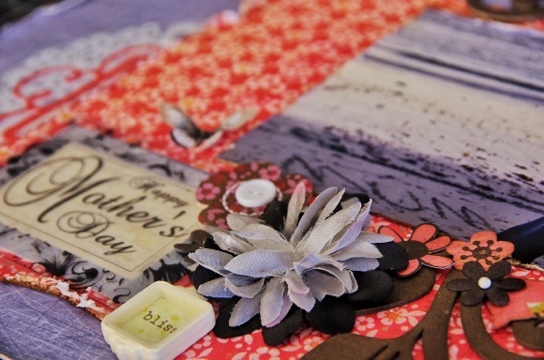 The Konnichiwa layout from the Basic Grey POTM didn’t suit her, so she made her own… and as I watched in wonder as this creation come alive I asked if she would mind if I posted it here for you to see. I just love how much FUN she has with this. 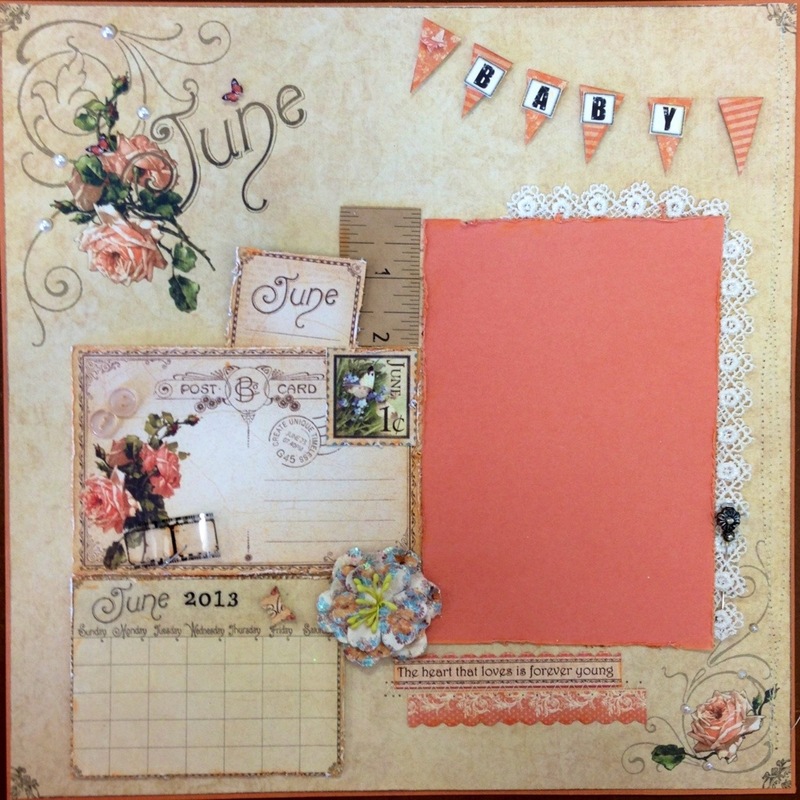 The basic grey page of the month is using the Plumeria range of papers and embellishments. It’s a lovely floral with touches of purple. 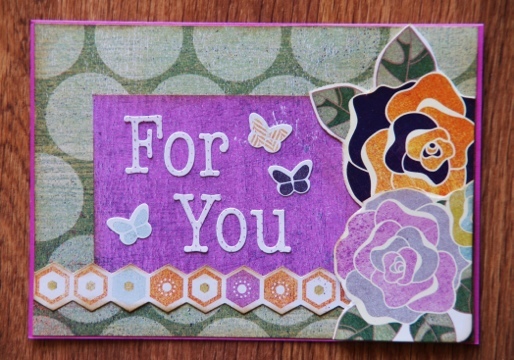 I don’t seem to use purple often, but I immediately liked it, and I loved the buttons and borders in the pack too. 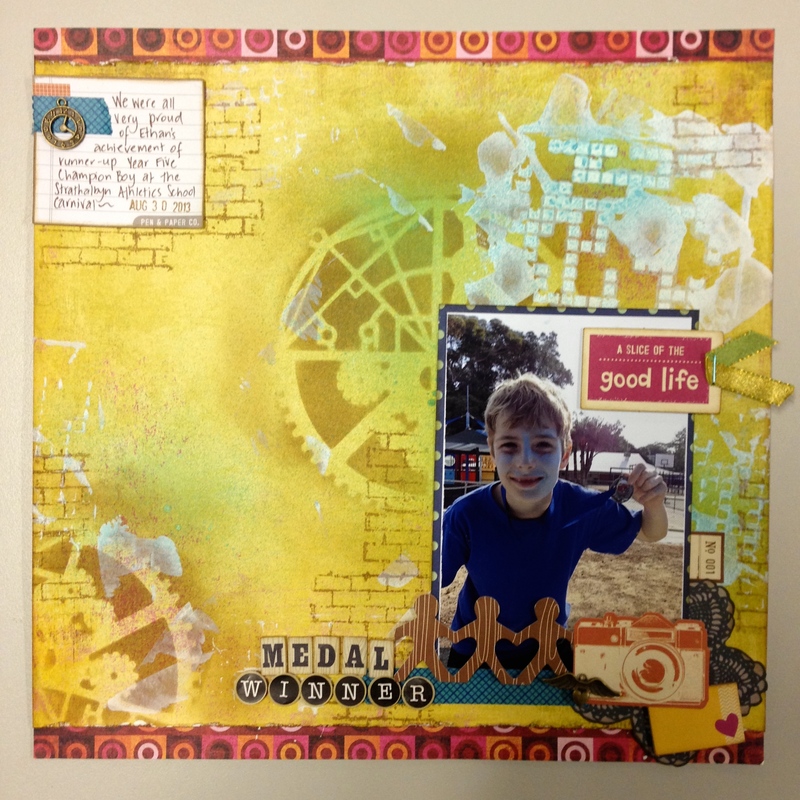 Last Monday night for our Open Scrap Night, I set to work on this layout, and again came home with a layout almost complete, again without photos, title or journaling. I promised myself not to go on until it was finished and I found that no photos would suit. The colour purple just was wrong. Do you recognise these photos? They are from our Red Dress shoot. Red most definitely does not go with purple… Unless you are in the Red Hat Society… then of course it goes! So I opened a few photos in photoshop and switched to black and white, thinking this was the fix-it-all solution. Usually works, but I felt it was lacking just a little, so back to photoshop I went with the original. Being dedicated to the cause of getting this layout done I kept at it, and ended up deciding to alter the colours ( for those who want to know, I reduced the saturation, then i picked out the ‘red’ hue only and altered it to purple. 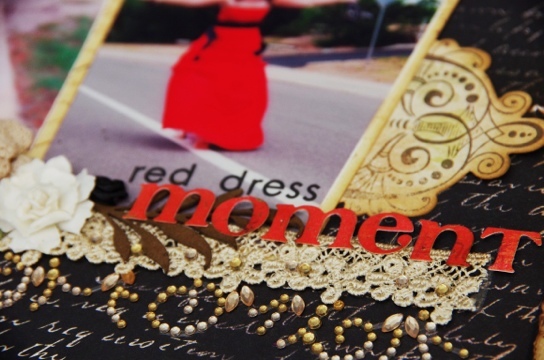 Not only did it work for this layout, but i still have a bunch of ‘red dress’ photos that I can use on another layout and one might not even notice it was from the same shoot. Funny faces – dontcha love them? I tell my kids off for this sort of behavior! 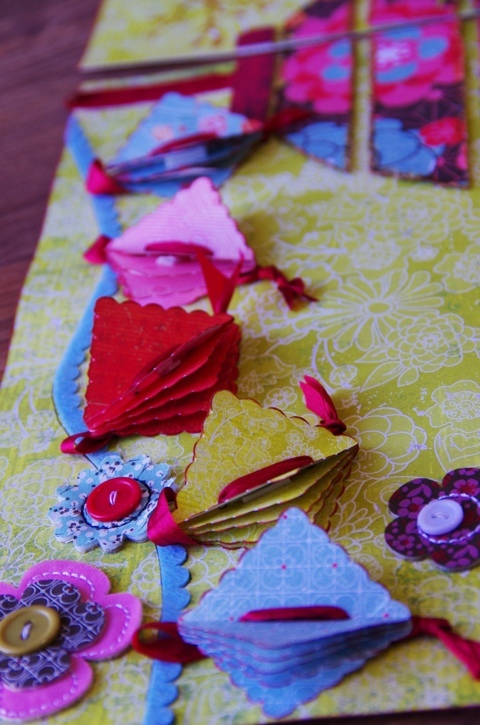 The journaling was printed on the back of some leftover, it took me a couple of tries, but there was plenty of paper to play with… Give it a go. Then with the last few ( and because by the time I got to this it was well after midnight, I put this simple card together. 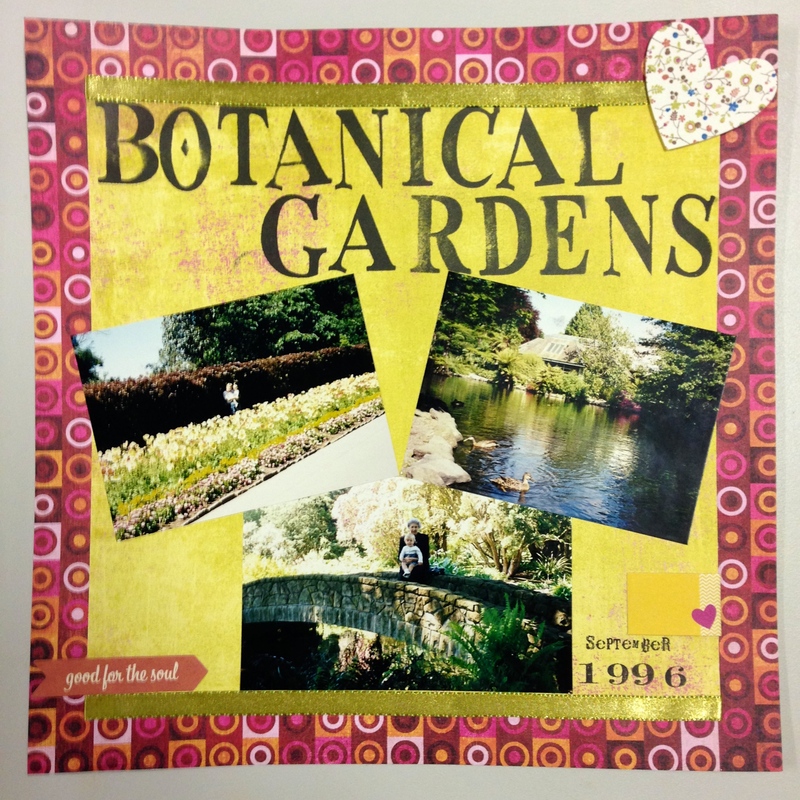 The flowers are cut from the back of the borders packaging. Thanks for looking. Have wonderful day! I’m working in my garden today, it’s beautiful gardening weather here. 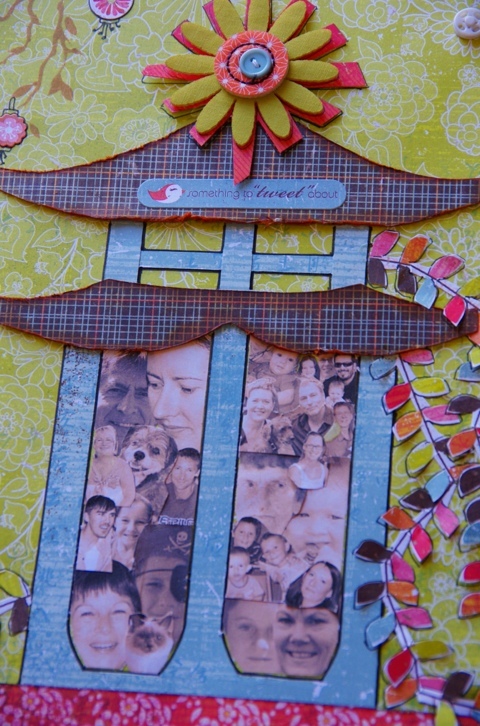 Do you find sometimes that you have a great idea for a layout but have trouble finding the photos to suit? 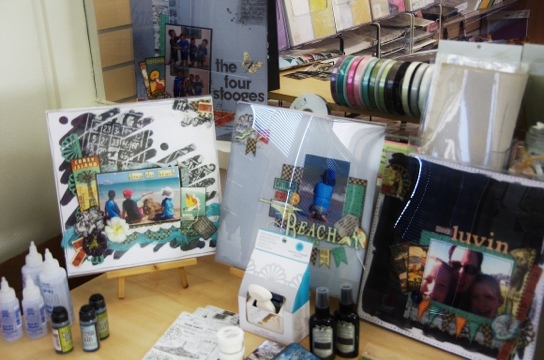 Or perhaps you’ve done a fabulous class (at let’s say a fabulous store), and you can’t choose which persons photo to put on such a special layout? 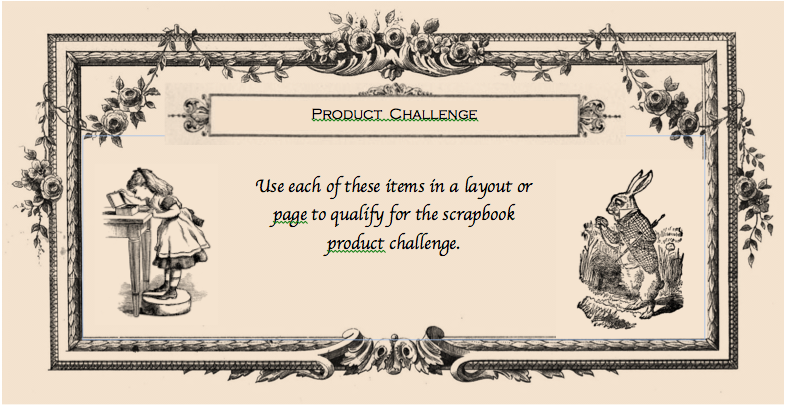 Or, you’ve signed up to do Page of the Month, and have now have a stack of photo-bare layouts? Or worse still, a bunch of kits waiting to be done? Ok… Maybe it’s just me. But I am sure I am not alone. I am sure this happens to many of us and you know what? Its okay! Yes, it is okay. One day, one fabulous day, you will get out that layout and have the perfect photo for it, or one day you will find yourself with 2 hours to spare one night and get out that kit, and put it together. I did this… But then you knew this list was going somewhere right? well, at least you were hoping. 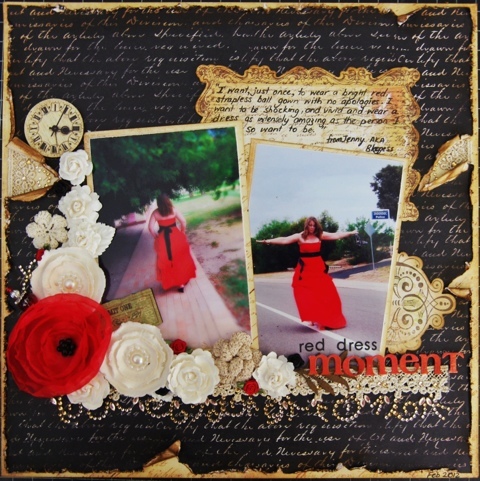 This double page layout from last years Basic Grey (Little Black Dress range) was complete, all but the photos. It sat and sat, then one night I decided to spend some time looking and I found 4 photos of the King and I together but none of them matched…. Solution? Make them all black and white. Problem solved. Layout complete. Happy Mamma. Leftovers? I have tonnes of them, and I never seem to use them, but can’t throw them away, so I took them along to my friend Sharon’s house and made a few cards. 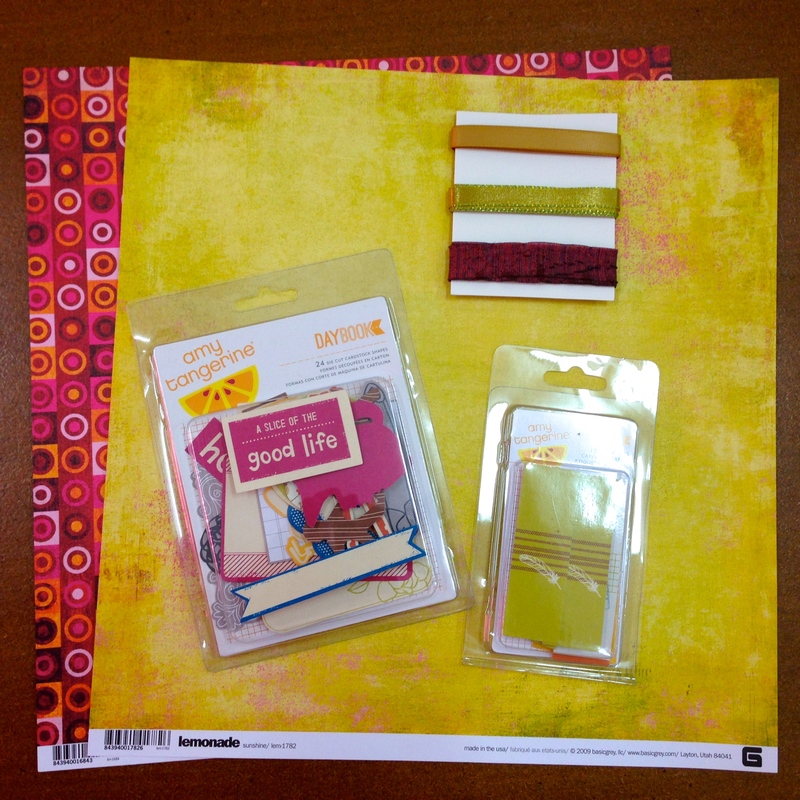 So these are just using our A5 card stock in white, with all Basic Grey leftover, and I did borrow Sharon’s Martha Stewart punches. Also had to add a couple of Crochet by Kim flowers too… Love these! So remember, one day you will find the perfect photos for that layout, but for now… Just enjoy the creative process and the rest will follow. The last class of last term had the kids using Texture Paste and Glimmerglaze. 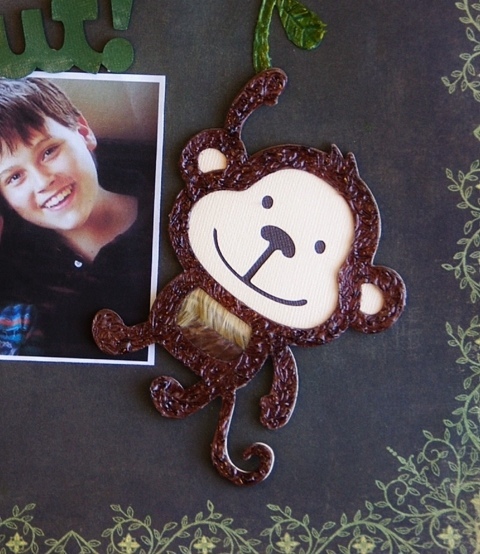 They were so awesome getting the right texture with toothpicks and adding the glaze to the monkeys and vines. They get to learn some terrific techniques and always go home with a work of art at each lesson. No wonder they keep coming back! I wonder what Em has planned for next term? 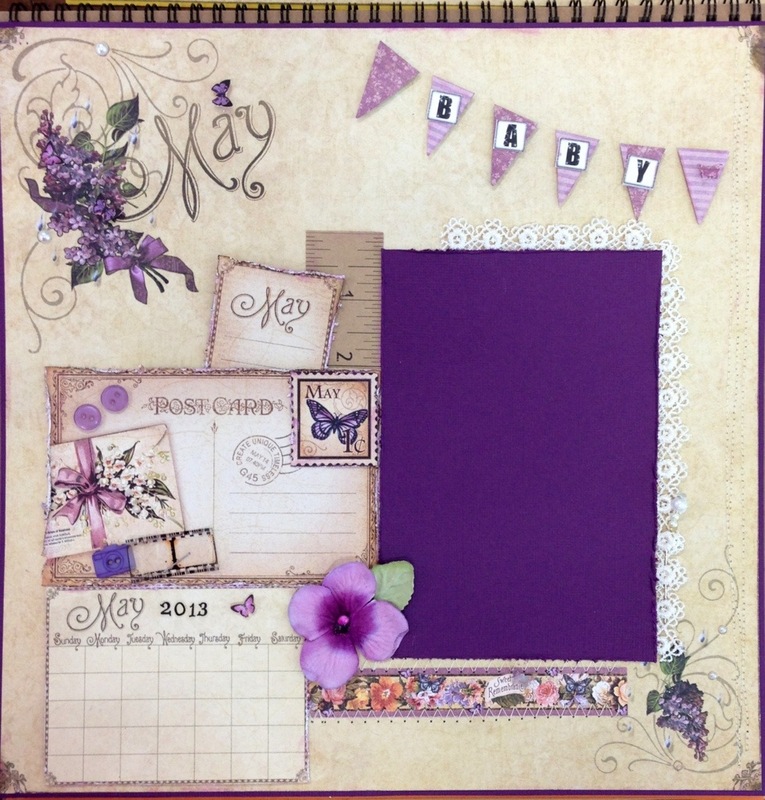 Our Basic Grey Page of the Month for March was using the Konnichiwa papers, and there was a fair bit left after Liz, Jo, Skye and I did our pages together. 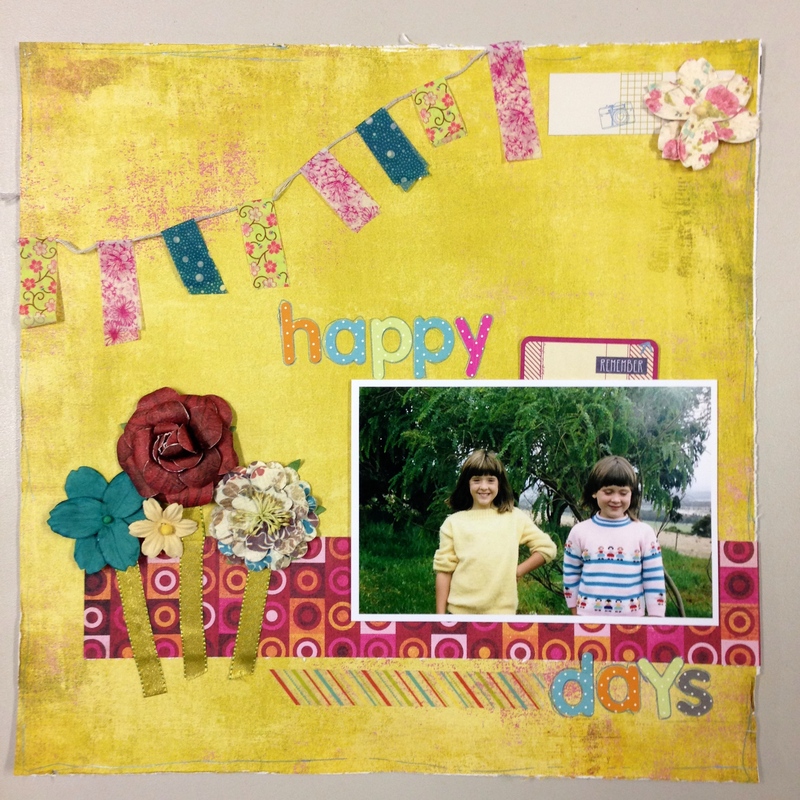 Liz the smarty pants went home to use the rest and not to be outdone (but of course she already has) I decided that I would use old things to make a page and incorporate something from this kit too. It was hard! I really like new things! So, I had a go, and this sat on my desk for so long… And gathered a whole lot of plastering dust along the way. I got back to it this Easter and this is what I came up with. It has some paper on it that is years old and I was pretty happy to dig out that Mothers Day quote from my stash. See! Knew I would use it one day! Scrunched up some old flowers too, my favorite thing to do with these since I saw Jenny do this at retreat last year and tucked a few of those Basic grey flowers in to tie in with the papers. 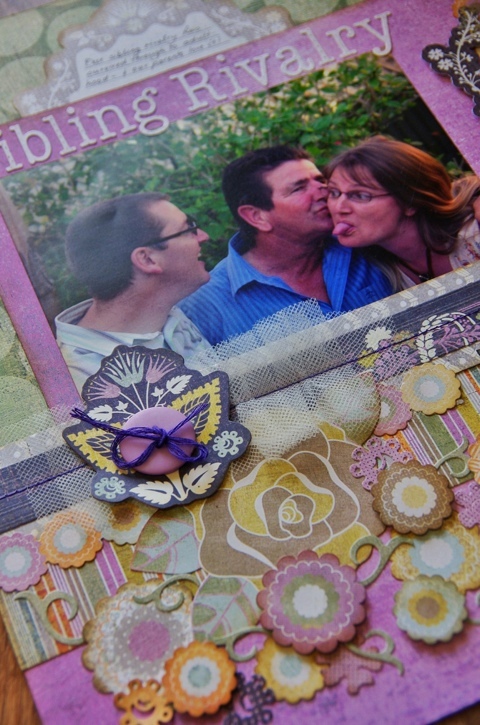 Certainly not my favourite layout, but happy to use old things and get another photo scrapped to put in the album. I loved this day, Mothers Day, at the end of the day, Mum and I, with the 3 youngest kidlets, headed to the beach for some photos. It got dark to quick and we missed the sunset, but the kids were happy to run about and get a little wet, playing in the sand and the surf. A lovely memory. Sisters. Brothers. We are not the same. We get to carry each other. 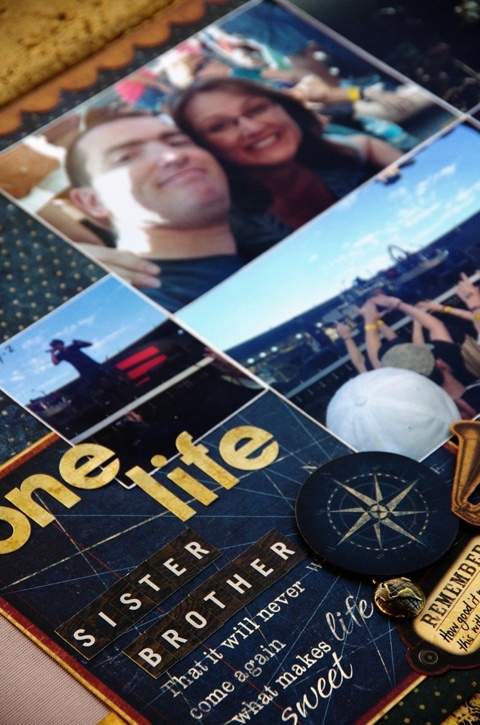 I finished scrapbooking a layout of the first U2 concert I ever attended. It was an amazing experience, we were right up the front… like 4 rows back, and to see the expression on my brothers’ face throughout this event, was almost better than the event itself! Priceless, how happy he was, and I am so glad to have been there to share it with him. 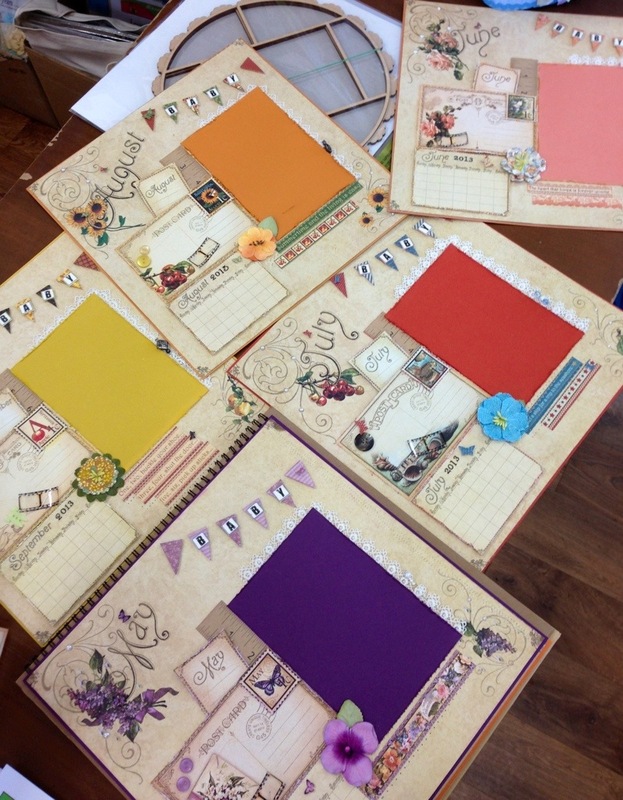 This is what scrapbooking is about, recording those wonderful moments, and bringing your albums to life with family stories ( and of course getting to use awesome scrapbooking products) this is the the newest of the Bo Bunny papers, this range is called Weekend Market, and it is luverly! Many of the stickers ad pages lend themselves to masculine, vintage travel, but there are lots of quotes suitable for Fathers, Dads and Grandpas too. Live life beautifully. Cherish today, dream tomorrow and live today. 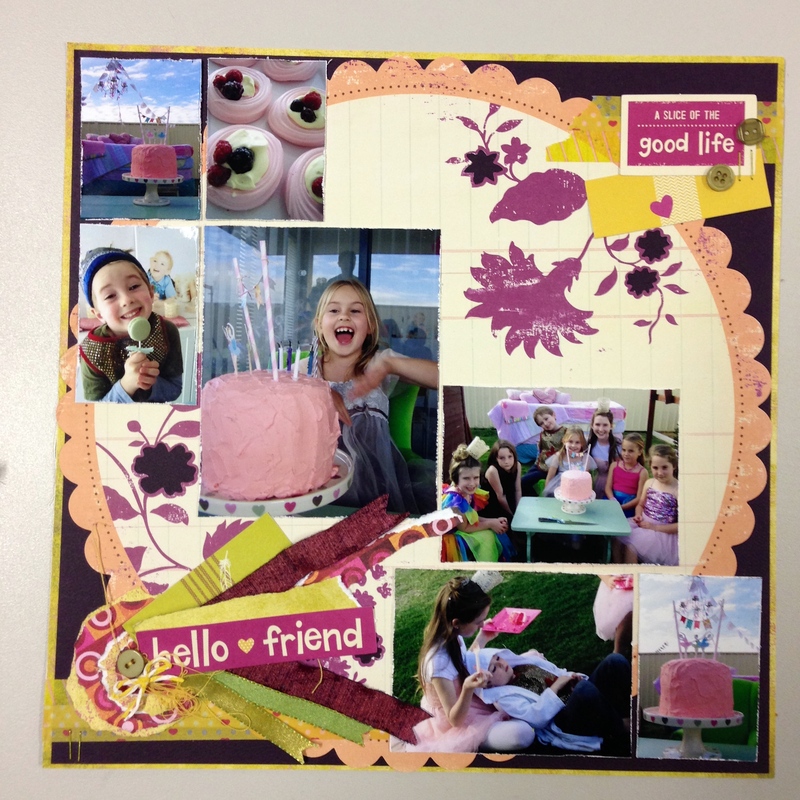 Lucky me – getting to spend the weekend scrapping and chatting with some of my favourite buddies! Why is it that time flies when you are having fun and all too soon it’s pack-up-time? Something magical happened on the weekend too – but I will have to wait to tell you, (because I am working and not supposed to be lolling about on the computer). 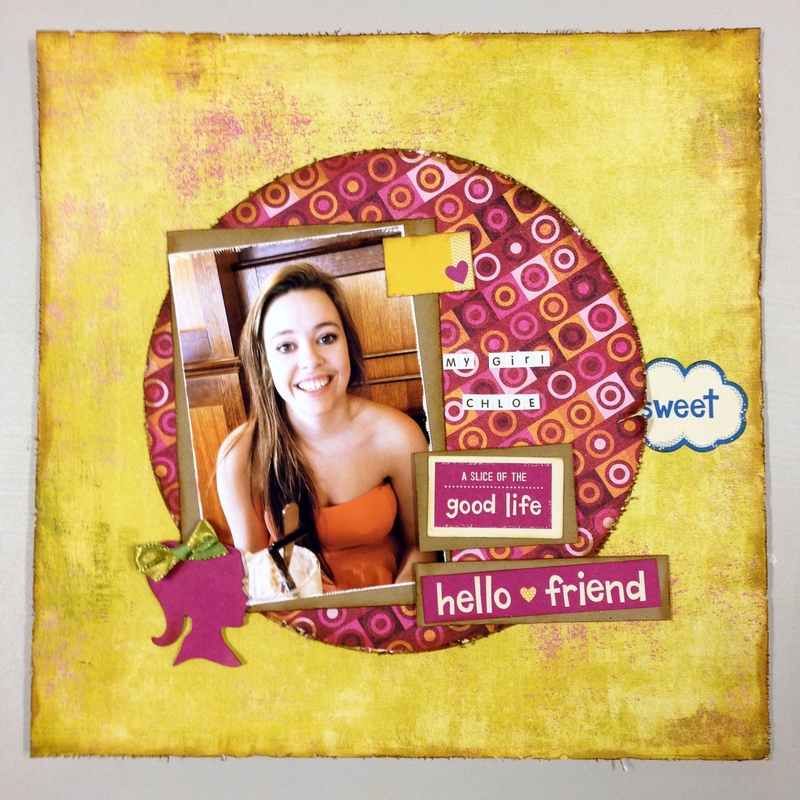 This is inspired by the lovely work of Gabrielle Pollacco. 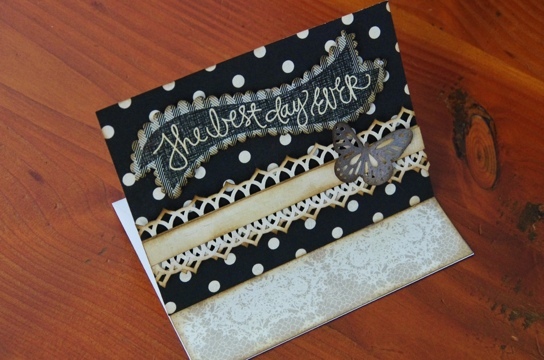 Loved getting my inks out on the chipboard and for stamping, I used chalk inks, distress inks and stains. 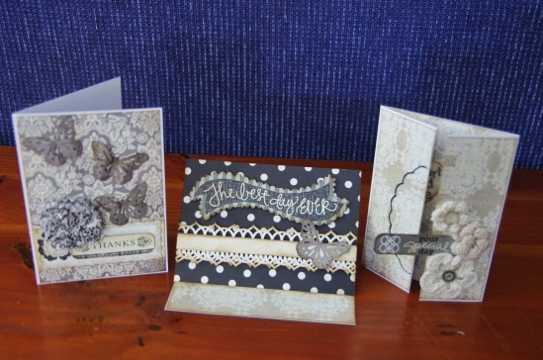 These are Authentique papers, some altered as well as a few scrap thrown in using left-overs. 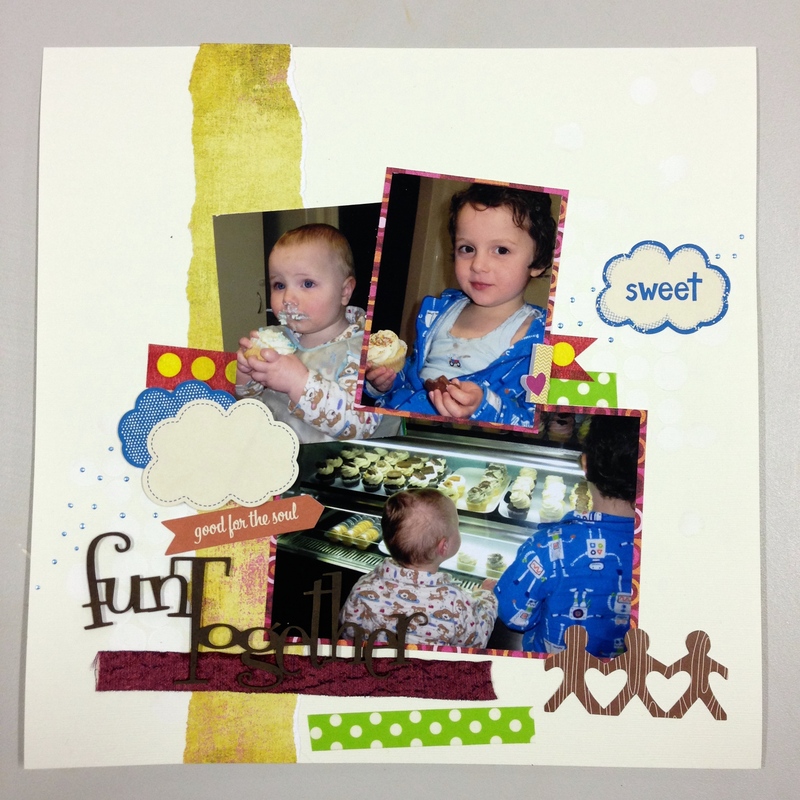 (pastel blue and caramel as well as the lettering) Love left-overs! 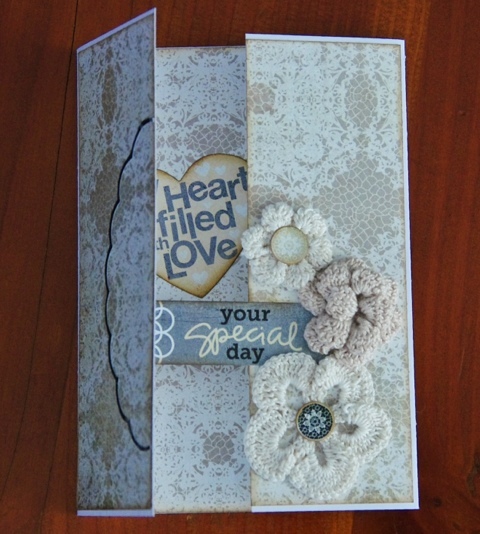 Hero art pearls and stamps (shells and script) and Scrap FX chipboard – the best bit and Prima swirly pearls too. I didn’t get a whole lot of pages completed over the weekend, enough to come home satisfied that I have finished projects to put in my albums and plenty of inspiration to create more.